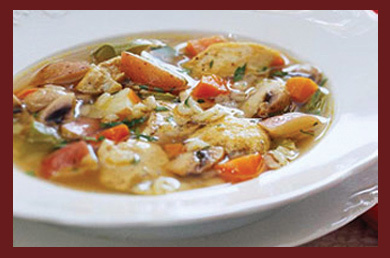 Fresh, healthy vegetables pair with hearty barley, chicken breasts, and touch of sage for a warm-you-up winter meal. 1. In a large Dutch oven bring chicken broth to a boil. 2. Add barley. Return to boiling; reduce heat. Simmer, covered, for 30 minutes. 3. Add chicken, celery, carrots, onion, dried parsley (if using), snipped fresh or dried sage, and black pepper. Return to boiling; reduce heat. Simmer, covered, about 15 minutes or until chicken is no longer pink and vegetables are tender. Stir in sweet pepper and fresh parsley (if using).